Over at ΕΝ ΕΦΕΣΩ a textual problem in Eph 5:22 is discussed. I had a look (long one, but not necessarily good) at P123 as published recently in the Oxyrhynchus volumes (we mentioned this one and P124 here). Text from 1 Cor 14 and 15, IVth century. The main difference is that I would only print a letter as secure if it is almost completely visible and would dot those letters that are incomplete but still likely. Consequently, I have quite a few letters less than Thomas in his transcription. Yet, I have no issue with any of the letters or, by and large, with the reconstructed text (perhaps ιβ rather than δωδεκα). It is quite handsome that one can use NA27 as the base text for this papyrus. The only possible textual variation then is whether the nomen sacrum πνα can be seen as the plural πνευματα (Thomas refers to Paap for support). Difficult to decide without knowing the scribal patterns in this particular manuscript. 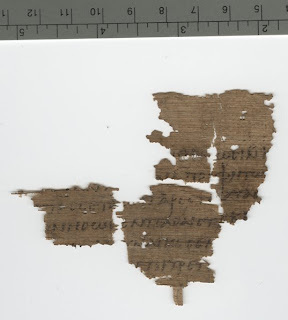 By the way, I think the fragments as they are on the Oxyrhynchus website are slightly displaced. Not much, but enough to be wrong-footed trying to squeeze all the letters into the blank spaces. Here is the third attempt. Some have commented that they liked the old burgundy, which gave this blog a distinct characteristic - I liked it too. This is now kept in the header. This is probably the most readable design thus far, but I will say no more. Your comments are more than welcome. Restoring the original Greek in the Gospels is often insufficient to restore the original meaning of the text. In some cases translating the Greek misleads the readers. Example: in Mat. 21,41 (kakous kakós apolesei autous) all modern translations I checked read something like “He will put those wretches (kakous) to a miserable (kakós) death” (NRSV). However, the Syriac Peshitta (d-bish bish nawbed ‘enun) as well as the Christian Palestinian Aramaic (bish bisha’ith – cf. Codex Climaci Rescriptus 1, in Müller-Kessler & Sokoloff, CCPA, IIA p. 23) understood the combination kakous kakós to represent the emphatic double adverb of the original (spoken) Aramaic. I think they are correct, and we should translate “He will completely wipe them out” or something like that. Reading kakous as a direct object, which is the natural from the Greek text only, is misunderstanding the sentence. 1. In the Gospels sometimes restoring what was originally said (in Aramaic) is more important than restoring what was originally written (in Greek). 2. Modern translations often pay insufficient attention to early translations of the Greek New Testament. Yesterday I happened to come across a brief review in JSNT 30.5 (2008): 96 of my monograph on Jude written by no other than Peter Head, and, funny enough, I was completely unaware of it. Anyway, the review was positive. Thanks for that Pete! Here is another experiment. What do you think? As we have hinted, we will be trying out new colors in the lay-out on this blog. This is a test and hopefully we will have some reactions. A lot of readers found text against the former red background color difficult to read, and that is what we want to avoid. Call For Papers: The New Testament Textual Criticism Section invites paper proposals papers for two sessions: 1) The first session will be devoted to the study and re-evaluation of textual types or text families of New Testament manuscripts. 2) For the second session, we welcome papers on all aspects of the textual transmission of the New Testament, especially those that focus on the social-history of early Christian textual transmission and the history and practice of textual criticism. Papers should be submitted via the online system. For questions, please contact AnneMarie Luijendijk at aluijend@princeton.edu. A few days ago I submitted my proposal for the first session, which is a paper on text-types and the evaluation of readings in NTTC. I very much look forward to seeing New Orleans, and Bill Warren's New Orleans Baptist Theological Seminary and the Center for New Testament Textual Studies for which he is director. Now I just hope for funding, both for this conference and another in Hamilton, Canada a few days before (which is the second part of the Mark and Matthew conference). The Biblioblog Top 50 has a new home, here. This list used to be kept by the pseudonymous NT Wrong, who now seems to have withdrawn from the blogosphere. Now the list is run by the Biblical Floccinaucinihilipilification Society (”the BFS”). Perhaps "NT Wrong" is their chairman. Anyway, according to the site "Floccinaucinihilipilification" is defined in Oxford English Dictionary as "the action or habit of estimating as worthless." On the Biblioblog Top 50 every biblical studies blog, or ‘biblioblog’, is ranked each month according to the total number of unique visitors. The Number One Biblioblogger for the month of January 2009 is James McGrath at Exploring Our Matrix. The foremost among "big shakers and movers" for the month is Dave Black (Dave Black Online) who went up 17 places to number 4. The ETC blog (this blog) went up 19 places to number 17. The ranking is based on statistics provided by Alexa. According to Alexa, the percent of global Internet users who have visited this blog has went up 90% in the last three months. That sounds much. I don't know if these figures can be entirely trusted, but, in any case, it is nice to see the positive trend in terms of visitors. a) The handwritten draft completed on 11 September 1959.
g) Another edition in 1995 with " few further corrections and improvements for this printing". These are all authorial texts (although variously constrained by lawyers and editors), but I'm not sure which one is the original text. In reflecting on this situation he says: "Rabbit, Run, in keeping with its jittery, indecisive protagonist, exists in more forms than any other novel of mine." In other words somehow there is a coherence between the nature of the story and its characters, and the complications of its text. I was about to post the following within the soon-to-disappear "Comment from Greenlee" thread that I initiated, but -- in view of all the vitriol that seems to have affected the ETC blog recently -- it perhaps is best to post this more prominently. On the Greenlee blog comments, one Bryan asked, "Isn't the problem modern text critics ... have with Greenlee's book is that it is interpreted and presented in light of Biblical Theism and Inspiration"? Indeed -- that was my original point in referencing Elliott's severe review. Apart from that issue (as one J.C.B. also had commented), virtually everything otherwise appearing in Greenlee's book is no different than what was asserted by Westcott/Hort, Tregelles, or most other textual critics of the past generations. From an evangelical standpoint, there should be no problem with the theological assertions of a respected evangelical text-critical scholar (which Greenlee most certainly is) in relation to the revelation, inspiration, or even providential preservation of the bulk of the NT text -- so long as that scholar does not use his theological beliefs to force a particular choice of text in those places where significant variants occur. Greenlee as an evangelical text-critical scholar clearly favors the NA/UBS critical text; as an evangelical text-critical scholar, I differ widely from that perspective. Yet Greenlee and I both hold similar theological positions relative to the overall nature of the NT Greek text, including all of the above-mentioned factors. One would think that a proper interrelation of theological belief and NT textual criticism position would be heartily embraced and endorsed by (at least) evangelical scholars rather than criticized so severely in what supposedly is a house filled with friends. There is a report on an attempt to extract DNA from manuscripts "with the long-term goal of creating a genetic database that can be used to determine when and where a manuscript was written" (here). I seem to recall a Cambridge based project attempting something similar a few years ago which I thought had been discussed here on ETC, but I couldn't find any reference to it via the Blogger search. What has happened in the past fifteen years that is “arguably more than in any comparable fifteen year period in the history of...the discipline”? Has there been a discovery of a new Sinaiticus? Something akin to the DSS in OT research? A massive papyri manuscript find? No, actually, nothing like that at all. So why the paradigm shift? Simple: the arena has become predominated by post-modernists who have thrown in the towel on the “original text” and have openly and shamelessly said, “Hey, let’s talk about what we can impute to nameless scribes based upon our mind-reading the reasons for their textual variations!” This is nothing less than an abandonment of the paradigm of the preceding generations, a hi-jacking of the discipline itself. While speculation about possible scribal prejudices may have its place, it will alway be just that: speculation. It is apparent that White knows very little of what he is talking about. Just because he happens to strongly disagree with Bart Ehrman’s views of the transmission of the NT, which I am not trying to defend, he seems biased against everything associated with Bart Ehrman in a very unfortunate way. Ehrman’s monograph from 1993, The Orthodox Corruption of Scripture was already out when the volume on the Text of the New Testament in Contemporary Research came out in 1995. To a great extent, the latter volume, with contributions from a wide range of twenty-three leading scholars, reflects a consensus on the status questionis in most areas of the discipline, while in some other areas a variety of views are represented. (Admittedly, the “Byzantine priority”-position held by e.g., Maurice Robinson is lacking.) In any case, I am quite confident that the second edition will in no less degree reflect the “width and depth” of scholarship in the field. A lot has really happened in NT textual criticism in the last fifteen year period, which has very little to do with postmodernism. A lot of significant work has been and is being done in an increasing pace, most notably at the leading centres in Münster and Birmingham. In addition to a steady stream of new MSS (e.g., 26 more papyri and many more uncials, minuscules and lectonaries), we have seen the publication of new major editions, and significant developments in methodology. And, yes, even some new scholars have entered the field ;-). As one of those, who, btw, has not “thrown in the towel on the ‘original text’,” I very much look forward to contributing to the second edition. Update Here is a link to a final response from James White, to which I had to respond in the comment section on this blog, since no comments are allowed on White’s blog. As one of the "blogmeisters" of the ETC-blog, I must admit that I am not a fast learner when it comes to technical stuff relating to the layout and usability of the blog. However, now at last Peter Head and I have decided to add a "bloglist" in the sidebar. This is something different than a "blogroll" (this is my impression at least). Whereas a blogroll is a list with links to favourite blogs, a bloglist shows headings and snippets of texts from all those favourite blogs, whenever they are updated. In our planned bloglist soon to appear (hopefully), I have added a very wide variety of biblioblogs (all blogs listed at www.biblioblogs.com) and other blogs dealing with issues relating to manuscripts and textual criticism, so that all our readers can use our blog with more benefit, and perhaps even as their starting page with regular updates and links of common interest. It took me half a day to figure out how this can be done. It is of course very easy thanks to built-in functions and integration between various tools, but it is not easy to figure it all out in practice, at least not for a text-critic. In any case, one necessary step is to update the blog template within Blogger (the host of this blog). This may cause the blog to look a bit differently in the course of work during the update of the lay-out. In other words, don't be surprised if the blog will look a bit different while I do this update. When this is ready I hope it will look nice, and I will be sure to do a back-up of the old template just in case. The Text of the New Testament in Contemporary Research: 2nd ed. Some 15 years ago Michael Holmes and I conceived and then produced the collection of essays, The Text of the New Testament in Contemporary Research: Essays on the Status Quaestionis. Our idea was to have authoritative essays on each of the major aspects of NT textual criticism, written by an acknowledged expert in the field; each essay was to give a history of research over the past 50 years (back to roughly the end of WWII) and an up-to-date "state of the question," along with all the significant biography. When the volume was completed, we dedicated it to Professor Metzger in celebration of his 80th birthday (we were his final two graduate students). What was then the state of the question has now become a bit dated. A lot has happened in fifteen years! Arguably more than in any comparable fifteen year period in the history of the 300+-year-old discipline. And so we have decided to put out a new edition. Some of the essays will be updated by their original authors; others will be rewritten by fresh new blood in the field (well, actually, the scholars through whom that blood is coursing); some will be rewritten from scratch by someone new. In addition we are planning on adding several new essays to the collection, which deal with issues/themes that have come to the fore over the past fifteen years of scholarship. We anticipate that the volume will appear in the Brill series New Testament Tools, Studies and Documents, which Eldon Epp and I edit (this is a combination of the old Studies and Documents that Eerdmans used to publish, and that Eldon edited, and the Brill series, New Testament Tools and Studies, that Metzger originated and that he and I had been jointly editing for a number of years, before his death). I'm writing this note to the list both to inform you that this new edition is in the works and to ask users of the first edition for any suggestions: things that should be changed, omitted, or added (especially: are there significant aspects of the discipline, or related topics, that are not covered but really need to be?). More pieces of the Greek Heliodorus inscription from 178 BCE have been uncovered. While this is not primarily concerned with textual criticism it does provide an important piece of historical and linguistic data relevant to the background of the scriptures. The text shows an official Greek monumental text from just before the outbreak of the Maccabean revolt and these pieces apparently anchor the original location of the Heliodorus inscription to Maresha. I have not yet seen them myself but look forward to the opportunity. Incidentally, the write-up in Ha-Aretz confuses things by calling Selevqos the father of Antiochus-4 instead of the brother. But a mistake in the modern press does not detract from the importance of this find. In the same vein, the remarks of those bloggers who discuss this news article as if it were a political invention or who criticize Ha-Aretz for publishing it, should be ashamed or just admit that they hate Jews. Musa and Mahmoud can write in Hebrew. I suppose I shouldn't have looked for any helpful comments on a newpaper webpage. Yes, the Maccabees were historical figures, and they tie in ever so marginally within the short-canon of the Christian scriptures through John 10:22. Washington Post 10/2 reports that a rare trove of Hebrew books are on display in New York. NEW YORK -- A rare trove of 11,000 Hebrew books and manuscripts went on display at Sotheby's this week as the auction house seeks to find a buyer for what is considered the greatest collection of Judaica in private hands. "I don't know any other collection quite like it in private hands. It even rivals some of the great institutional collections in the world," Arthur Kiron, curator of Judaica collections at the University of Pennsylvania, said. "There are very few cultural moments like this one where a collection of such great significance is made available for sale." ...and Jim Davila over at PaleoJudaica has more on those Dead Sea Scroll fragments for sale at a antiquarian book fair in San Francisco which we have reported on earlier. I just heard that Harold Hoehner died today. I always found him a great encourager (he was around at Tyndale House on sabbatical from Dallas Theological Seminary during my PhD days); and a great believer in evangelical textual criticism (the concept if not the blog - see the numerous full discussions in his massive commentary on Ephesians). There is a brief tribute to Harold Hoehner here. Actually, we missed it (I was wondering why my wife has not been talking to me -- was I supposed to buy her some chocolates or maybe a Greek grammar?). The The International Organization for Septuagint and Cognate Studies has declared February 8th International Septuagint Day. Apparently, they had a team of eight scholars sit in individual vestibules for two days and think about what day they would celebrate the LXX. All eight were inspired to choose the eight day of the second month. Amazing! In truth, this story is somewhat apocryphal. The real history of the origins of the so-called International Septuagint Day are lost to us, so I have made up this handy legend which I hope others will inflate to suit their own theological agendas. TW: In an excellent post Tyler Williams, who didn't miss it, gives his reasons to study the LXX, here. Happy 50th Anniversary, Institut für Neutestamentliche Textforschung! The Institut für Neutestamentliche Textforschung (INTF) was founded by Kurt Aland on February 7 in 1959, to be exact. Since this time until now, the INTF has been the world leading institute for the investigation of the text of the New Testament. It is difficult to describe with words what this institute has meant for the discipline, and where we would be without it, so I will not even try. Instead I will first share something from my personal experience of this institute and its staff. Then I will cite the history of the institute as it is described at the INTF web-page. In 1998 I began my study of the Greek New Testament. During this time there happened to be a sales at the local Christian bookstore of some of the very few academic books in English, and among them was Kurt and Barbara Aland's introduction to New Testament textual criticism plus Ehrman and Holmes volume The State o the New Testament Text in Contemporary Research. I bought them of course, and read them almost instantly, and was then "hooked." I decided to write my exam paper (leading to a Bachelor of Theology) in textual criticism. 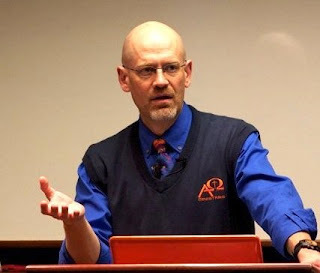 I became a member of the TC-list (a discussion list run by Jimmy Adair), about which I was tipped by Bart Ehrman one of the editors of that book I had just read. On that discussion-list I sent out a question whether anyone had a good subject for me to write about. Only co-blogger Maurice Robinson replied and, in addition to this kindness, he suggested a very nice subject. I was to examine some 34 MSS which he suspected were related because of a peculiar shared reading in John 8:8b-9a: "he wrote on the ground the sins of each... after having read them..."
Of course, the only way to examine these MSS was to access them at the institute in Münster. So I wrote Klaus Wachtel, who was also on the TC-list, asking if it was possible to come. He kindly replied that this should be no problem, but that the normal policy was to write a formal request to the director, Barbara Aland. I did that, and was welcomed. Klaus Wachtel also helped me to arrange lodging at the local "Diakonissenmutterhaus" (I perceived it as kind of a combined hostel and home for retired nuns in the Evangelic Lutheran Church). This place was very good and, besides, it was cheap and perfect for a student without any funding (17 Deutsche Mark per night, and I could even lend a bike for free!). Strategically, I planned the trip so that I came to Münster during Maurice Robinson's own visit. He had been working for years collating the Pericope of the Adulteress in all available Greek MSS. I had trained to read Greek MSS from various books, but I was a bit nervous when I went to Münster. On the first day at the institute I was welcomed, and showed to a little workroom for guests researchers where Maurice Robinson sat. I started out with my first microfilm, supplied to me by the palaeographer of the institute, Klaus Witte, who has ever since that day helped me to get appr. 700 films out of the cupboards (during five visits)! The only problem was that in the little room there were only two microfilm readers, and Maurice, of course had the best one (he was there first, and, after all, he was the professor)! The one I got was a very old and heavy machine brought to Münster from DDR by Kurt Aland in the 50's! This was not a good start, and during that day (which I remember very well) I felt some panic - how should I be able to read 34 of these manuscripts in four different test pericopes during my three weeks - it took hours just finding the right place to start in one manuscript! However, I soon asked to change to one of those (relatively) modern machines and was welcomed into the collation room where university students were collating manuscripts for the institute. It was a relief to sit down at one of these machines, and soon I got the hang of it; three films per day, five films per day, seven films per day...etc. It was also nice to get acquinted with some German students. Although Swedes have a lot in common with Germans, I still made a lot of funny experiences of German culture in this room. First, everytime I or someone else sneezed, everyone would say "Gesundheit" (like in a choir), and when someone was entering the collation room they first had to knock on the door before entering (but without expecting the "come in"-reply). In Sweden, if we knock (which we probably don't do as often), we have to wait for the reply, "come in"). Anyway, I greatly enjoyed this time, and the kind staff, although on this occasion I actually don't remember meeting Barbara Aland. The only downside what that I missed my family very much, and my one-year old son, but time flies. On the last day I was invited to Klaus Wachtel's room to discuss the results of my work. Well, the results were promising. Eventually I wrote that exam paper, which practically got me a research post as Ph.D. candidate at Lund university. The paper was rewritten to an article, published here, which is my first publication. Wachtel also kindly shared with me a paper he was going to present in Lille on some aspects of Colwell's quantitative method. So, during these weeks I met some great scholars in textual criticism for the first time. Also, another very nice member of the staff, Beate Köster, brought me the guestbook of the institute, where I signed my name among all great scholars in the discipline who had visited the institute during the years since 1959. The last Swede who had been there was René Kieffer, working on his Au delà des recensions? L'évolution de la tradition textuelle dans Jean VI, 52-71, but that was ca. thirty years earlier, so it was about time! After that first visit, I have been to the INTF many times, and I have always been met with great hospitality. Welcome to share your own experiences of the institute in the comment section! "The Institute for New Testament Textual Research (INTF) was founded in Münster in 1959 by Prof. D. Kurt Aland, D.D. Litt. (1915-1994). Aland had taught at the Martin-Luther-University Halle-Wittenberg and simultaneously at the Humboldt-University Berlin until 1958. After his teaching authorisation had been withdrawn and a disciplinary procedure been opened because he was regarded as 'enemy of the state,' he left what was then the German Democratic Republic and received a post as a research assistant at Münster. It was only after the Institute had been founded that in 1960, he was appointed Professor of History of the Ancient Church and New Testament Textual Studies at the University of Münster. Since the 1950s Aland had been working on Eberhard and Erwin Nestle's Novum Testamentum Graece. At the INTF the concise scholarly edition saw further revisions and publications, until it became the trade-mark of the institute under the name of Nestle-Aland hinzu. In 1966, a second concise edition intended for translators, the Greek New Testament, was published. The great papyri discoveries of the 20th century were of special relevance for a new reconstruction of the text published in both the 26th edition of Nestle-Aland and the third edition of the Greek New Testament. Both editions contain the identical text while differing in their apparatus. However, the main objective of the Institute was the so-called Editio Critica Maior based on the entire tradition of the New Testament in Greek manuscripts, old translations and New Testament quotations in ancient Christian literature. The pre-requisite for the realisation of this task was the sifting and examination of the entire manuscript tradition of the Greek New Testament. Under the supervision of Kurt Aland the INTF first of all collected almost the entire material (partly on extensive manuscript travels), followed by analyses in single editions and specific studies in preparation of the Editio critia Maior. Kurt Aland found a friend and patron in Bishop Hermann Kunst. In 1964 the latter established the Hermann Kunst Foundation for the Promotion of New Testament Textual Research that has granted crucial financial support to the Institute ever since. In 1979, Kurt Aland founded the Bible Museum that presents the work of the Institute to the general public. In 1983, Prof. Lic. Dr. Barbara Aland succeeded her husband as director of the Institute. Under her supervision, the analysis of the material that had been started under Kurt Aland continued and was made accessible for research in numerous publications. The first supplement of the Editio Critica Maior with the Epistle of James was finally published in 1997. Barbara Aland led the Institute until 2004. Since October 2004 Prof. Dr. Holger Strutwolf has been in office as director of the Institute and the Bible Museum." To this we should add that recently, in 2007, the North Rhine-Westphalian Academy of Sciences and Humanities accepted the Editio Critica Maior (ECM), presented by INTF, as one of their long-term projects (Hooray! ), which means that the INTF now has funding for the production of their major critical edition ECM for decades ahead! The project work started in January 2008. Congratulations! For an extensive biography and bibliography of Kurt Aland, see the entry in the Biographisch-Bibliographische Kirchenlexikon, here. Update: In the comment section, Klaus Wachtel from the INTF mentions "one additional milestone of the recent institute's history, namely the 2005 agreement between IGNTP and INTF to work together at the ECM of the Greek New Testament. It is this agreement of collaboration that made for an acceptable time frame of the entire project and helped considerably with our proposal to the Academy of Science and Humanities." He further adds that 7 February was the date when Kurt Aland's proposal was officially accepted and that the institute took up work on 1 March. An official celebration of the anniversary, to which we look forward, will take place later this year. Turkish biblical authorities (well actually they are police) testify that "they believe the manuscript could be about 2,000 years old." This manuscript appears to be not-that-ancient according to Peter Williams and J F Coakley. The Reuters article may be accessed here. To put the problem of evidence for lectio difficilior into context, Royse's and Head's studies showed the ratio of singular omissions to singular additions among early papyri running at about 75:25 (in percentage terms, or, for every three omissions you get one addition). That sort of evidence, to me, is incontrovertible - scribes omitted far more often than they added. 1. Easier readings would be more attractive to subsequent copyists, and more likely to be perpetuated, whereas harder readings are more likely to be later corrected. Therefore, the fact that harder readings predominate among singulars means little because the long-term effect on textual transmission would be in the opposite direction. To me, this objection (a) is circular reasoning, for it assumes what it should be proving (that scribes try to improve the text, rather than introduce further difficulties), (b) is not based on any evidence - the question of at what point a reading becomes so difficult that it tempted scribes to alter it should be one for evidence to determine, not armchair speculators, and (c) it puts the canon beyond the reach of any contrary evidence. It is like the story of the man whistling in Chicago who said he was whistling to keep the tigers away. When it was pointed out that there were no tigers in Chicago, he replied: 'See, it works'. 2. A second defence involves introducing the issue of intentionality by claiming that lectio difficilior only applies to intentional changes. This defence, likewise, brings with it questions and problems. (1) It apears to commit the fallacy of the excluded middle - it ignores the possibility that a reading might have been created in more than one stage, as a result of a wandering mind or as a salvage reading of an earlier nonsense reading. (2) Even if we cull nonsense readings and cases of hom. from the count (as likely to be unintentional changes), we are still left with easier readings as an extreme minority, for the great majority of singular readings remaining are neutral or harder. This leaves the 'nuanced' defender of lectio difficilior with a conundrum. Either intentional changes to the text rarely seem to result in an improved text or, alternatively, the vast majority of textual changes must have been unintentional (even though they appear otherwise). Either way, the objection (and lectio difficilior) fails. In short, the objection does not dispose of anywhere near enough evidence to stand. And this is where I would like some help ... Are there any other good defences of lectio difficilior that I should be considering? We have come at last to the final part of the book review session (SBL 24-32) of David Parker's An Introduction to the NT MSS and Their Texts (CUP), featuring David Parker's response. Again, this is a recapitulation from my notes and memory. Parker began by expressing his gratitude for the kind things that have been said about his book. [Rather humurous in light of the serious critique that had just been raised.] He now wanted to share some of his experiences writing the book, and this also answered some of the critique. On the one hand, he did not make the new order of this introduction up. On the other hand, he did not use the "proto-type model" of Scrivener’s introduction. Parker thinks this old way is not the best way to go about today. Instead, he wanted to create a story in a narrative framework. The ordering of the book simply represents the story Parker wanted to tell. He decided to tell two stories. The first is the “knowledge of documents”-story. It locates the book in a philological tradition. Part one is about the documents. Part two describes how the documents have been studied, why the text changed, and how to edit the text. Part three shows how this applies to the sections of the New Testament. Finally, concerning the third part of the book, “the sections of the New Testament,” it is usual to provide a section termed something like “practice.” Parker had found these parts boring in other books; they want the reader to imitate. If these rules are so useful why does none agree on their application? Housman said “every textual problem is potentially unique." In his response, as in the book, Parker continued to show his disinterest for the canons of criticism. He does discuss thoroughoing ecclecticism, conjectural emendation, and the like, but such is admittedly woven into the overall framework of the book. Then some words about indexing and navigating: Here Parker largely blamed the publisher (Cambridge University Press), since he himself wanted to put everything in there. The publisher did not. They wanted a “target”-perspective (focused on those issues that get a paragraph). Parker will discuss this again with the press for future editions. The issue of readership is important. The book is intended to share contemporary scholarship within the guild. There is no point in writing an introduction for anybody. The discussion has to take place. Already Parker’s earlier monograph, The Living Text of the Gospels, was a kind of introduction for a more general audience. All four of the panelists are North-American males over 50 years. Parker says the book is also aimed at the new generation. We need more voices. About the choice to put the images on a website, it is because they come out too badly in the printed book. All you see is an outline of a manuscript. You see so more on the website. There is only this way to go. You can always access the internet on you mobile phone but the display may be a bit small [laughter]. Then Parker proceeded with Epp’s defense of text-types, i.e., Epp’s objection against Parker’s rejection of the concept: Parker said he accepted everything in Epp’s response [Did I misunderstand this!?] But then he took a hyphothetical example of 50 copied MSS. The bottom-line of the example was that the concept of text-types is very static. Parker wants to know how the forms developed, a family tree, how the text changed. The division into text-types does not tell you that, and the contamination between text-types is a hinder. The CBGM gets around the problem with contamination. It is now possible to build a family tree of the textual flow. Text-types are no longer particularly important, we are now able to move beyond them. Parker now brought up that they are reconstructing Paul’s collection. The goal is to edit the corpus. There is again a gap between the “initial text” and the author’(s’) text. In the question of exegesis, there will always be a gap. It is positivistic to say that NA27 is what Matthew, Mark, Luke and John, etc., wrote. Just read what the editors of NA27 say in their introduction. Finally, Parker emphasized, supposedly concerning what method he uses, that every place in the tradition may be potentially unique as to what factors (call them canons if you like) are applicable. What exactly is reconstructed by the CBGM, the editors of the the ECM themselves are actually not agreed on. The easiest hypothesis, says Gerd Mink [Occam and I agree], is that the “initial text” of a given book is the original text, not introducing any other explanation. Particular factors like the affect of a collection have to be addressed. But, interestingly, the results of the CBGM in the Catholic Epistles show that the individual books have their distinct transmission history, suggesting that we can reconstruct beyond the point when the books were collected. Moreover, I have already pointed to the use of intrinsic evidence to move beyong the “archetype,” and this also applies to an archetype of a collection. I am now eagerly awaiting the results for the Pauline corpus (Parker nodded his head – he is too). Okay, I know this is a bit late, but for completeness sake I now continue my "SBL sessions review marathon." This is the third and fourth part of the book review session (SBL 24-32) of David Parker's An Introduction to the NT MSS and Their Texts (CUP), featuring Michael Holmes and Larry Hurtado. Disclaimer: Note that this is a summary in my own words. I took notes very quickly, and there may be things that I have misunderstood, but, nevertheless, I hope to have captured the essence of the reviews. He then gave some concrete examples of its extensive treatment of subjects like corrections in MSS, editing text and editions including the challenge of electronic editing, tools for manuscript studies, collating MSS, information about subgroups of MSS, etc. Then Holmes brought up some less satisfying issues, some of which I do not repeat (e.g., those that were brought up in Ehrman's review). For example, as a result of the organization of the book, which does not promote usability, and the incomplete index it took Holmes very long time to find the indication of how many Greek and Latin bibles that have been preserved. Parker does not mention the term "reasoned ecclecticism," but Parker apparently uses this method himself. He focuses on the documents, then the texts. But there is no discussion of method or criteria. The canons are woven into the discussion of examples. The method is scattered and woven in. Parker says: “Textual history is the history of the changes in wording of a text” (p. 179). This involves collection of material and examination of the evidence "in order to relate the different forms of text chronologically” (ibid.). Parker rejects the concept of text-types (cf. Epp’s review that focused on this question), but Holmes is dissatisfied with the terminology Parker uses himself to describe the history of the text. What does he mean by “forms of text”? Presumably the text as a whole, as reflected in Parker’s definition of textual variant: “the entire text as it is present in a particular copy” (p. 4). At other times, however, Parker seems to speak about individual variation units, or the distinct textual history of individual books. In sum, Parker’s description of the concept of textual history is ambiguous and the terminology is unclear. After all, Parker’s view of text-critical methodology and textual history reflects a consensus to a great extent. However, not his view of the goals and objectives. Parker has based his whole book on Hort’s dictum that knowledge of documents should precede judgments of readings, which actually forms an inclusio of the book. Whereas Hort’s goal was ultimately to reconstruct the authorial text, it has now been complemented by secondary goals and different terminology (e.g., “initial text,” etc). Parker thinks the initial text is from the end of the second century. And the gap between the initial and authorial text is a big problem. Parker suggests that variants should be treated as early forms of commentary (not authorial). His formative vision is a move from the first traditional goal to the second goal, the reconstruction of the history of the text. Here Holmes finds himself in strong disagreement with Parker. Take the statement that contemporary editors do not claim to reconstruct the author’s text. They may have been wrong, but have they not expressed that purpose? This is still an open question. Interestingl, Holmes here refers to Peter Robinson (Parker’s close associate at the ITSEE in Birmingham), who has indeed expressed his desire to reconstruct the authorial text of works he edited! Holmes continued to emphasize the continuity between the text at the end of the second century and the text that preceded it. He brought up some critique of William Petersen’s use of patristic evidence (e.g., Justin’s text), to which he appealed in order to prove that the text was unstable during the earliest era. Holmes concluded that the challenge of showing continuity between the text before and after the second century is not greater than of showing discontinuity. Parker is correct that we should not underestimate the challenge, but we should neither exaggerate it. Hurtado was impressed by the width, and cover of languages, tools and resources, and more. Parker’s own enthusiasm is apparent. He promotes the study of manuscripts in the whole first part of the book. Hurtado felt gratitude and appreciation for very much. He was a bit surprised of Parker’s attempts to offer theological advice in the book (I assume he primarily had in mind the section 5.3.3 “Textual criticism and theology” on pp. 185-90). 1) Who is the primary reader? Hurtado suggested that the primary readers among students will only be a small number of post-graduate students. There are little incentives for less familiar readers to become enthusiastic themselves. As several other reviewers, Hurtado complained about the lack of an explanation of criteria. This is curious since the CBGM is ultimately based upon such criteria. The dicussion of textual criticism is particularly lacking. The order of presentation is warranted in one way (focusing on “knowledge of documents”), but the decision is a misjudgment for an introductory book, where one must particularly take into account the interest of the readers (who are primarily interested in the New Testament). Hurtado thinks the publishers must be interested in offering an attractive introduction to the field of textual criticism too, as the title suggests. The undifferentiated enthusiasm with all MSS is not effective (cf. Hurtado’s own particular interest in the earliest MSS pertaining to the early Christians). Parker seems to presume that MSS of any period of time will be interesting for the student. Moreover, Parker should have made better connections between the parts of the books (I presume Hurtado especially referred to the first and second parts, “the documents” and “textual criticism and editions”). Hurtado continued with some specific problems e.g., with some terms. The definition of reading seems to be better applied to a variation-unit (including “place”). Especially in an introduction these labels and the consistent use of them are very important. Moreover, there are also some unfortunate errors concerning MSS, e.g., P12is not a copy of Hebrews in particular, and not a roll. Then Hurtado mentioned some words about the CBGM method, mainly suggesting that what is generated depends on the criteria used in individual units. He did not think the CBGM is an advance in terms of how we evaluate the evidence in individual passages, it just offers more transparency. In the time for questions I brought up this last remark about the CBGM. I actually think the CBGM is an advance not only in transparency, because it offers a new and more controlled way of moving from internal to external evidence, a kind of “calibration” of the external evidence. In the final post on this book review session I will attempt to summarize David Parker’s response. Tyndale House is sponsoring a new blog for scholars associated with the Tyndale House or Fellowship. Any member of Tyndale House or Fellowship can enter their publication details (but note the disclaimer!). This has just begun, but should contain summaries by the authors of quite a few TC-related articles. See here. What might be the first, or among the first, instances of someone specifying the restoration of either the "original text" or "the autographs" as the goal of NT textual criticism? Includes the verse translated in English as: "Art thou that Daniel, which art of the children of the captiuity of Iudah..."
"I don't know if these are genuine or not, but if they are, it is unfortunate to find them like this in the public marketplace, although I suppose it's better than their being lost entirely. If you should happen to be in the position to buy these, I hope you will consider donating them (or at least be willing to sell them) to a museum, preferably one in Israel. If you must keep them, please, please be willing to make them available for specialists to study. It will do no harm to the value of the fragments and it will insure that the contribution they can make to history is not lost." "Scholars continue to divide over whether John the Baptist acclaims Jesus as ‘the Son of God’ or ‘the Chosen One of God’ at John 1.34. This article argues that transcriptional and intrinsic probabilities, supported by the testimony of a few early manuscripts, favour the latter reading. However, in adopting this reading, the claims that (a) the variation took place in the course of a battle against adoptionism and (b) ‘the Chosen One of God’ supplies corroboration that the original tradition underlying the Synoptic baptismal accounts was based solely on Isa 42.1, are found to be unnecessary and methodologically problematic respectively." "This article proposes that the variant Βαλαxs1F71κ in the xs1D51372 text of Jude 11 be read in light of theological tendency in the Bodmer codex, especially as evidenced in the christological variants of xs1D51372. Initially, scholarly opinion dismissed the ‘Balaak’ reading as nothing more than an inexperienced copyist's careless mistake. Though recognizing the older view to be unsatisfactory, recent explanations are also inadequate. Given neutral or positive traditions about Balaam in Judaism, and in the context of the early Christian belief that the Spirit of Christ inspired the OT Prophets (including Balaam), the article makes a case for reevaluation of the variant." "In 1993, Dieter Lührmann published a reconstruction of the more intelligible side of P.Oxy. 4009. He demonstrated that this side, which he called the recto, consists of passages parallel to Matt 10.16 par., Luke 10.3 and 2 Clem. 5.2–4. He also argued that the passage stems from the Gospel of Peter. However, Lührmann considered it impossible (‘ausgeschlossen’) to reconstruct the other side of the fragment. The aim of the present article is to demonstrate that a full reconstruction of this less intelligible side of P.Oxy. 4009, lines 1–13, is possible and that it enriches our knowledge of the Gospel of Peter with a new pericope which is an interesting parallel of Luke 7.36–50. The reconstruction also demonstrates that the side reconstructed by Lührmann is actually the verso, and that both sides together point towards the well-known anti-Jewish redactional tendencies of the author of the Gospel of Peter."